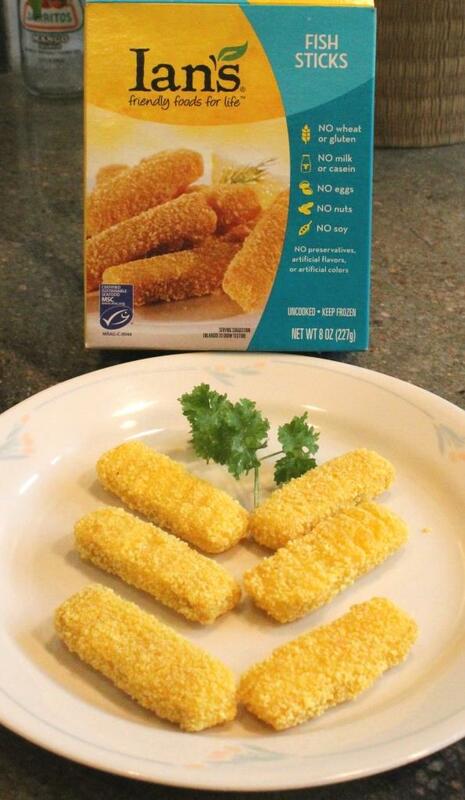 These fish sticks are sort of a conundrum. I’m not quite sure how I feel about them. You could easily eat them as finger food, because they are not all greasy and nasty. Dip them in tartar sauce or cocktail sauce, whatever. They have good flavor – there’s no nasty fish taste. They have the flavor of a good fish stick. It’s the consistency that perplexes me. The fish is fine – very nice, actually – I’m referring to the crust. Clearly, the crust is made mostly of corn meal. It’s pleasantly crispy, but a little thick and difficult to get a fork through. Hence being perfect for finger food. I cooked these at the maximum (400 degrees for 15 minutes, flip the sticks, then another 10 minutes) and they did not brown, not unlike many gluten-free foods. So don’t judge their doneness by their brownness. They looked just as yellow when they came out of the oven as when they went in. These Ian’s Fish Sticks are wheat- and gluten-free, milk- and casein-free, egg-free, nut-free, and soy-free. The crust/breading is made solely with corn and seasonings. If you have a corn allergy, sorry. My box came with 13 fish sticks. The nutrition facts claim the serving size is 6 sticks and there are 2.5 servings per container. Obviously 13 sticks does not give you 2.5 servings. Just be aware. It’s not a big deal. This 8 ounce box is normally $6.99 but I got it on sale at my local Safeway for $4.99. 2 servings for that price – you be the judge. They were definitely a nice change of pace. Amy’s and I don’t have the best of relationships. I find some of their foods a little too “earthy” for my taste. 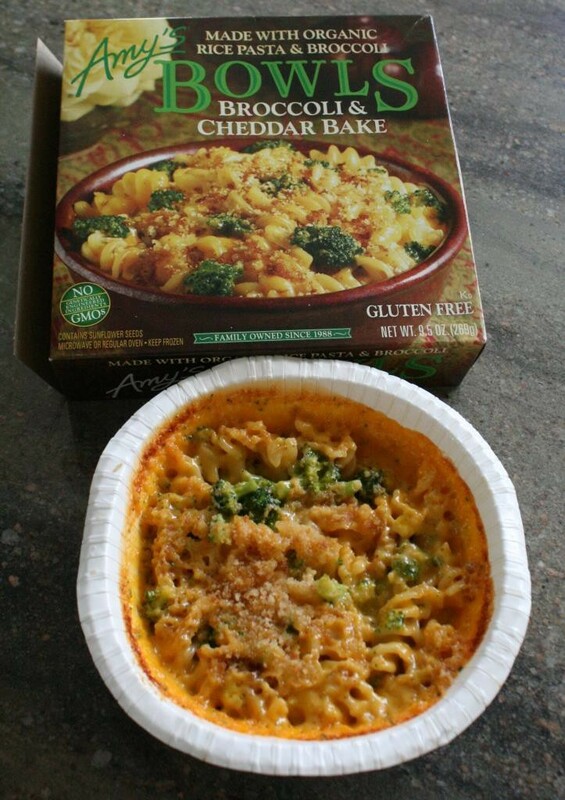 But this gluten-free Broccoli & Cheddar Bake is a winner. 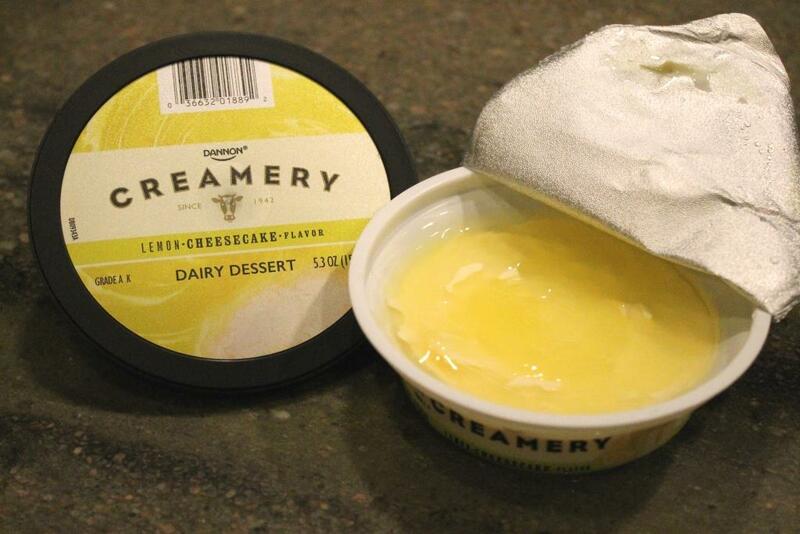 It bursts with robust cheddar flavor and is creamy and smooth. There is always a hint of the broccoli throughout, of course more so when you bite into a floret. And these are nice, bite-size florets – not the “leftover stems or stalks or whatever” pieces you often find in frozen meals. This dish is certified organic, and has 430 calories, 20 grams of fat, 640mg sodium, 44g carbs, and 16g protein. It heats up in less than 5 minutes and is fantastic comfort food for those cold winter days. Only one thing could make this dish better: meat. (You didn’t realize I was a meatatarian? *sigh*) So I sliced up and heated a hot dog, and then mixed it with the dish. Awesome! If you love cheese, this is the dish for you. You can always find more information at www.amys.com. Sweet, tender, delicious steamed clams. Having grown up near the New England coast, I know a thing or two or three about seafood. I also know that living here in the inland Pacific Northwest, I can’t find too much of those wonderful dishes out here. Or – not at least that I could afford. But I made a wonderful discovery the other day. Seafood isn’t something people (at least not me) like to take a chance on. If I think it’s going to be disgusting, what’s the point. 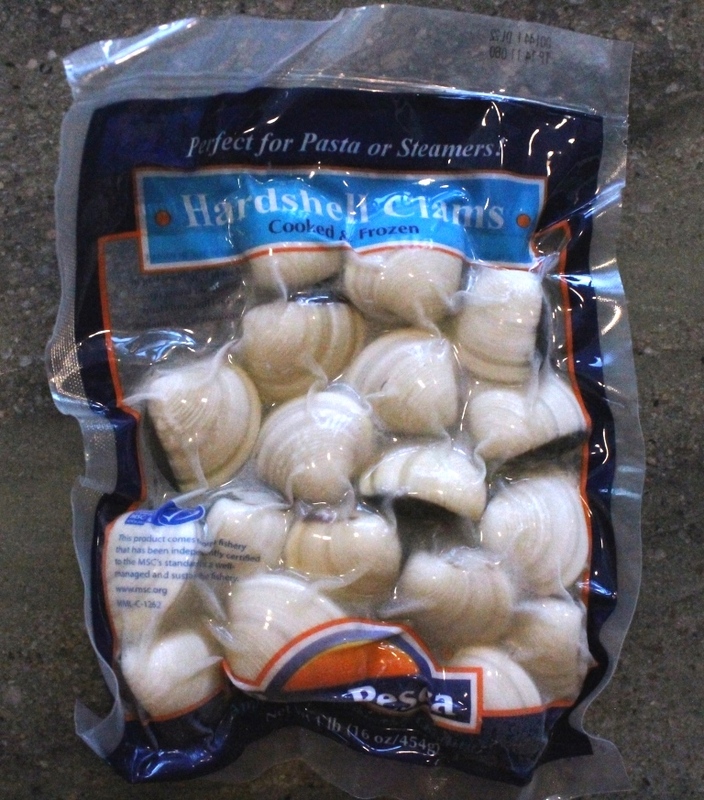 So when I saw a one pound package of frozen hardshell clams on sale at my local Safeway for $3.49, I was skeptical. Native New Englanders have long said “bah humbug” to frozen seafood. Longing for something different on my gluten-free, soy-free, salicylate-free diet, however, I gave in and made the purchase. And I am so glad I did! Quick and easy: one pot, one plate and less than ten minutes meant a fast, delicious meal and easy clean-up. 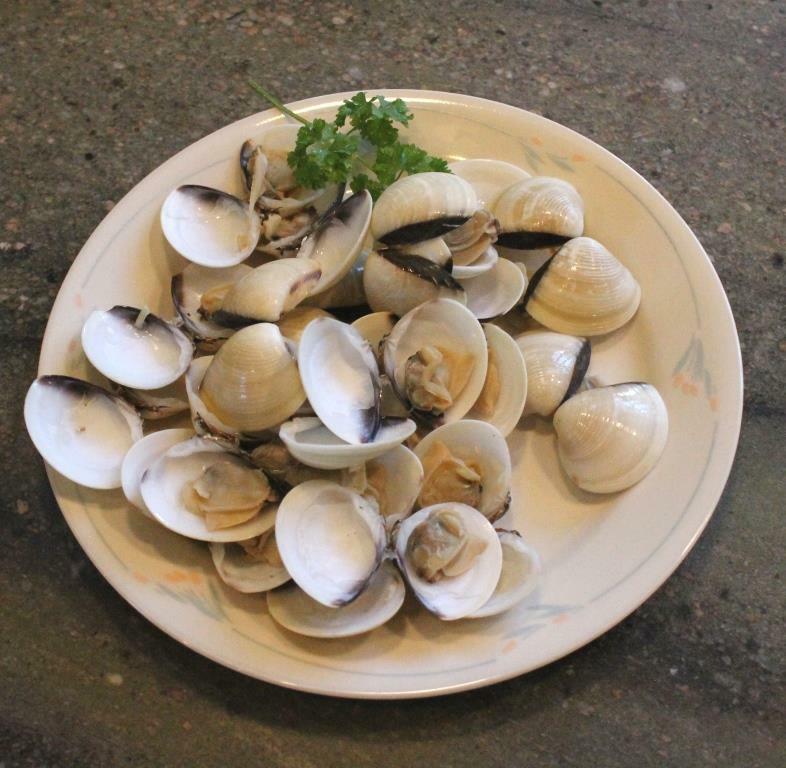 I followed the “Classic Steamers” recipe on the back of the package and these clams were perfect in 5 minutes of cooking time. And yes, it gets better. They say one serving per bag. That means not having to share. I love that. I also love the 89 calories, .9 grams of fat, the 12 grams of protein, 3 grams of carbs, and 38% of the daily recommendation of iron. These clams were so sweet and delicious that I needed very little butter on them. They’d be great with a little garlic and tossed with pasta. I’m too lazy for that, though. Boil & eat – no thawing – that’s for me! I do have one regret: I only bought one bag! Must go back and get more! 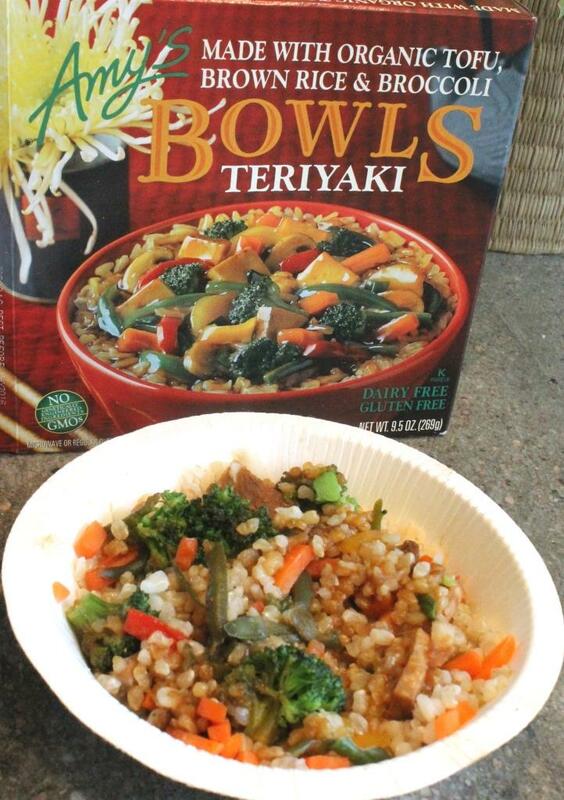 I’m not sure how I feel about this Teriyaki Bowl made with organic tofu, brown rice, and broccoli. It’s a little spicier than I would like. It was certainly quick and easy enough to prepare – a total of 4.5 minutes in the microwave. And they ask you to remove the plastic for the second half of the cooking – and no, it didn’t splatter all over the inside of my microwave. At only 290 calories and 4.5 grams of fat, that’s pretty good for a meal. 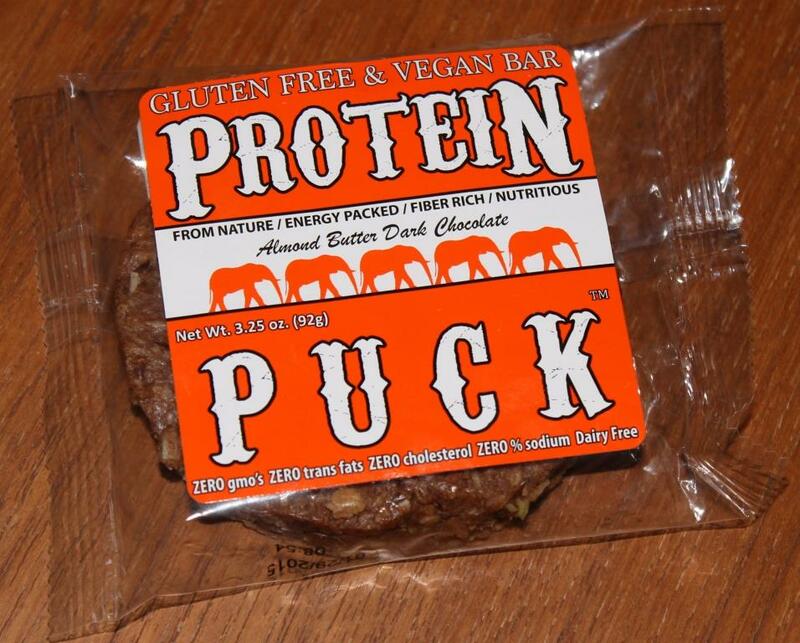 780 mg of sodium, 12 grams of protein, and 0 cholesterol is also nice. The consistency is good – nothing is hard or chewy or mushy. If it had just a little less kick to it (which is probably not even noticeable to a regular person), this would be a viable dinner option for me at only $3.99 at my neighborhood Safeway. If you don’t mind your teriyaki just slightly on the spicy side, then this dish is for you. Me? I’ll stick with making my own version of teriyaki – with Worcestershire sauce, honey, ginger, garlic, and butter – used in this Tangy Cashew Chicken recipe. You can always find out more about Amy’s at www.amys.com. 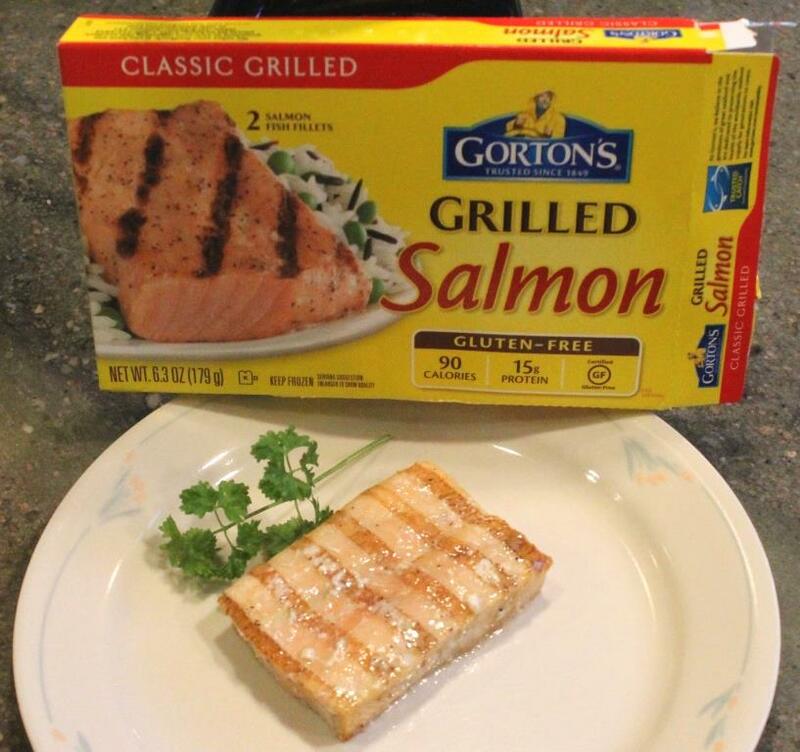 Thank you, Gortons, for this delicious, gluten-free fish. 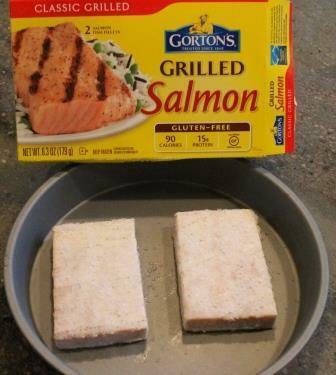 The Classic Grilled Gluten-Free Salmon Fillets are definitely winners. Sure, it would be easy enough to pawn nasty salmon off on those poor Celiac people, but no. Good stuff. Trust me. Like their grilled pollock, I found it amusing to discover two pieces of frozen fish resembling bricks. (Hmmm… fish bricks and fish sticks?) But I have to admit, these did cook up very nicely. No nasty, fatty veins or slimy, pungent brown sections. Just nice, tasty, pink wild-caught salmon. I like salmon on salad, and when I broke this piece up, I actually found a bone in it. So, yeah, it’s real fish. I find salmon to be more filling than white fish, which makes these servings quite generous. 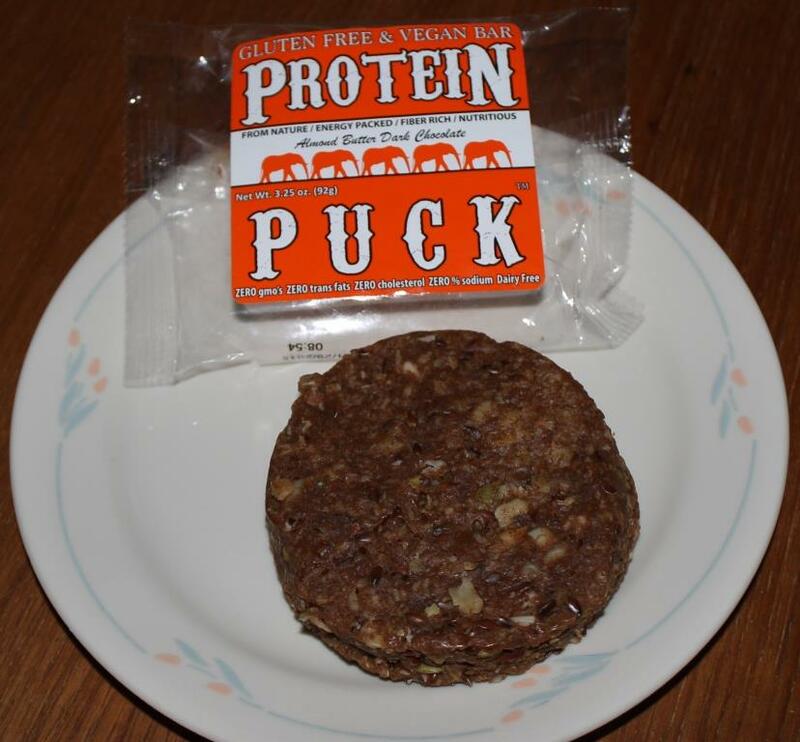 Each brick has 90 calories, 2g fat, 350mg sodium, only 3g carbs, and 15g protein. And, I got these on sale for $2.99 a box. That’s an incredibly reasonable per pound price for salmon.